← What Does it Take to Become a Climate Leader? Shouldn’t we hold our elected governments to a higher standard than we expect from the folks who sell soap? Or at least as high a standard as we expect from marketers? In October 2013, the US Federal Trade Commission (FTC) announced six enforcement actions, including one that imposes a $450,000 civil penalty and five that address biodegradable plastic claims, as part of the agency’s ongoing crackdown on false and misleading environmental claims. In Canada we rely on a voluntary approach, with enforcement weak or non-existent. Strictly speaking, greenwashing rules apply to claims made about a product. However, it’s getting harder to tell the difference between a marketer selling a product and a government pitching for votes. Susan Delacourt explores this connection in her recent book Shopping for Votes: How Politicians Choose Us and We Choose Them. According to one analyst who reviewed this book, “Canadian politics has moved into an era when voters no longer think much of themselves as citizens, with duties and obligations and longer-term perspectives, but as taxpayers in a consumer society who shop among politicians for those who will give them the most at the lowest cost”. Our government has reduced greenhouse gas emissions while protecting and creating Canadians jobs – greenhouse gas emissions are down since 2006, and we’ve created 1 million net new jobs since the recession – and we have done this without penalizing Canadian families with a carbon tax. I won’t examine the jobs number, although I’m skeptical of it. The greenhouse gas emissions claim is incomplete and misleading. The reason that GHG emissions are lower “now” (the latest year with data is 2011) than they were in 2005 is that Canada’s emissions fell during the global recession. Emissions have been rising again since 2009, and the trend is going in the wrong direction. Harper’s government did not reduce greenhouse gas emissions, the global recession did, supplemented by provincial actions such as Ontario’s phase out of coal fired power. 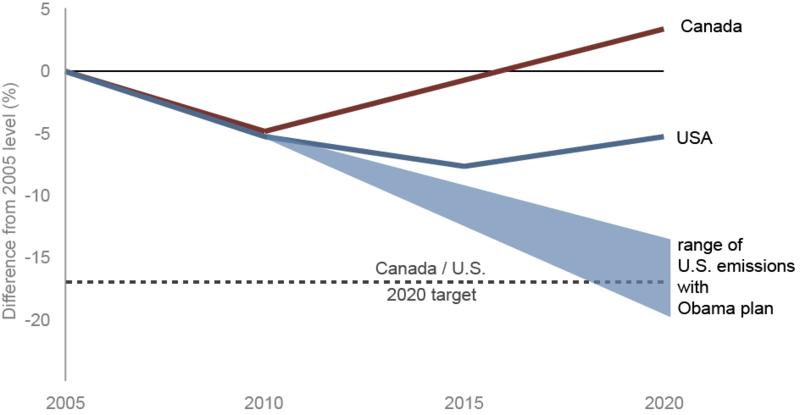 According to the government’s own analysis, Canada will miss, and miss badly, its emission reduction target of 17% by 2020, from a 2005 baseline. Environment Canada estimates our GHG emissions will be 20 per cent higher than our 2020 commitment. … this year’s edition shows that Ottawa has done nothing over the past year to change this trajectory: there is not a single new policy (my emphasis) on the list of federal initiatives to reduce emissions in Canada. So it’s little surprise that the country is no closer to reaching its emissions target. In fact, the gap between where we are headed and where we should be headed has grown slightly in the past year. The central conclusion of this year’s report is inescapable: without a serious ramp up of effort from our government, Canada is headed for another major broken promise on climate change. This is bad news for a lot of reasons, not least for our credibility. “So it is significantly off track right now,” Taryn Fransen, another report author, said. If Canada was selling soap, it would be guilty of at least two greenwashing sins. First the “Sin of the Hidden Trade Off”, committed by suggesting a product is “green” based on an unreasonably narrow set of attributes without attention to other important environmental issues. Add to that the “Sin of Irrelevance”, committed by making an environmental claim that may be truthful but which is unimportant or unhelpful for consumers seeking environmentally preferable products. Claiming that Canada is making progress on climate change ignores the bigger reality that, absent drastic actions, we are on track to renege on our promises to the international community. Mr. Oliver’s claim that Keystone XL would enhance energy security, create thousands of jobs and support the environment is wrong. For many of us concerned about adding value to our non-renewable resources, meaningful and long term jobs for Canadians, global warming and climate change, his brazen misrepresentations are insulting. Canadians expect their federal government to demonstrate leadership on climate change. We also expect them to tell the truth. Perhaps it’s time to put in place greenwashing rules for governments. This entry was posted in Climate Change, Sustainability and tagged Canada, climate change, GHG emissions. Bookmark the permalink.